The oil pump is an essential part of the engine lubrication system. The main purpose of engine lubrication is to reduce friction between gliding components, which results in a reduction in wear. Oil is sucked by the oil pump from the sump, pumped through filter and cooler, and finally conveyed through pipes and channels to the lubrication points. Oil pumps are usually driven by the timing gears of the engine. In commonly installed gear pumps, a pair of gears conveys the oil over the outer tooth spaces, along the wall of the housing from the suction to the discharge side. Precisely coordinated axial distances of the gears, with high surface quality, as well as narrow clearances, ensure the provision of the required quantity of oil or oil pressure at all times. The tooth profile is measured using a gear-measuring machine; thus guaranteeing exact running properties. The toothing is additionally hardened, so that wear remains at a minimum. 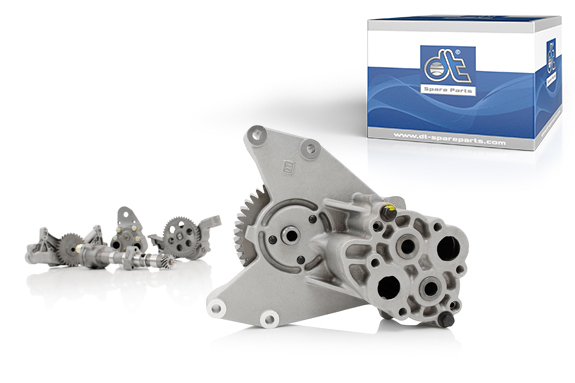 Oil pumps of the brand DT® Spare Parts are 100 % tested for their performance. The supplied installation instructions is to be observed. Before installing a new oil pump, the lubricating and drive systems of the engine must be cleaned and may not show any signs of damage. The oil filter is also to be changed. Before operation of the pump, the gears of the new oil pump should be wetted with clean engine oil. Any leaks or unusual noises after installing the oil pump may indicate further defects in the engine. In addition to oil pumps, DT® Spare Parts also offers all standard oil sumps, oil coolers, oil pressure valves and oil filters.